So Lionel shows they still have some of the old RS4 powered motherboards. That's fine and all , but in comparison to the err manual for the old Rail sounds commander there is a slight difference. The Lionel is missing the volume pot and instead has an extra 3 pins next to the speaker connection. 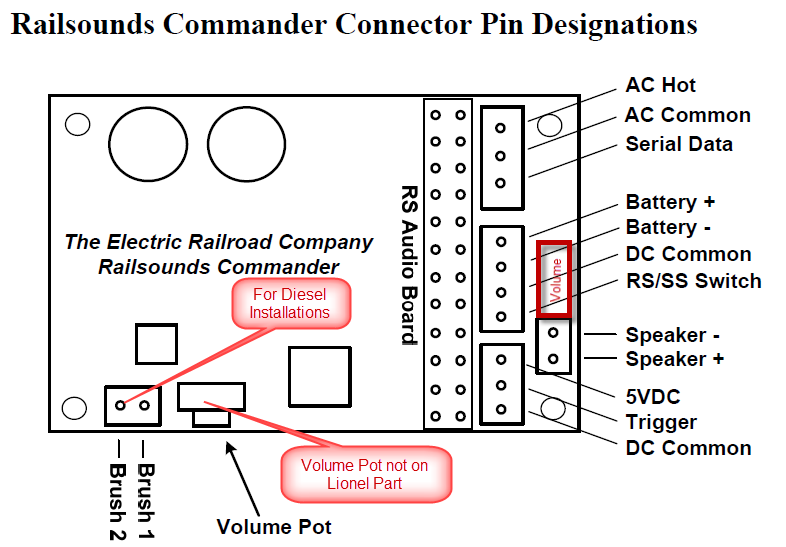 My question is what is the wiring situation with the Lionel board compared to the ERR board. I am planning to buy one from Lionel and would like to the know the different wiring for the Lionel one. Basically the same thing. The missing three pins on the bottom row in this picture are in parallel with the volume control, with the Lionel model it was designed to be connected to an external pot. You can actually buy the 10K pot and drop it into the holes and use this like the ERR board. 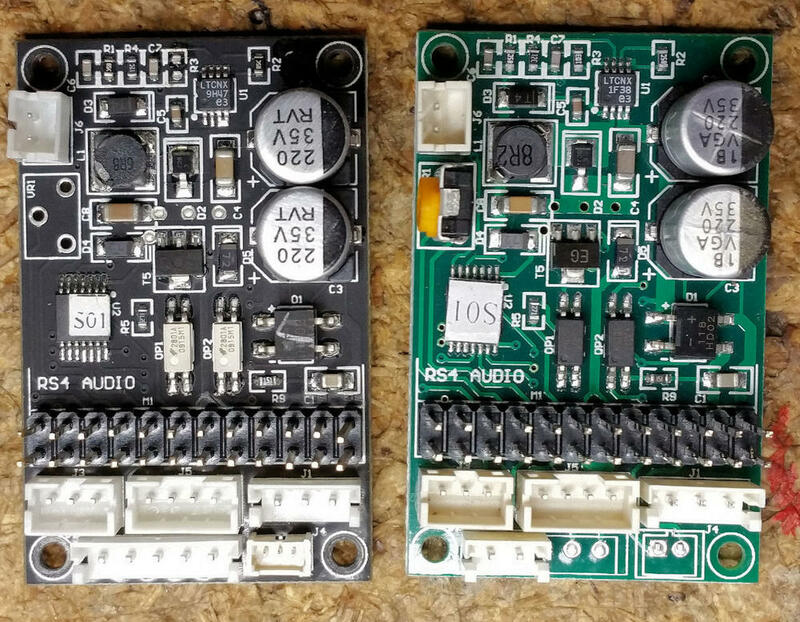 The documentation for the old RS Commander is useful if you're using this board. Also, note that the back of the board has a lot of legends for the pins. 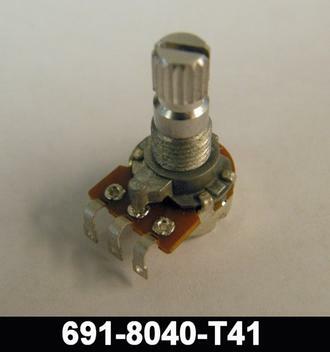 If you buy these from Lionel, test them right away, a couple of us got bad ones from Lionel parts and didn't know for months. Note that these are NOT compatible with the RailSounds 6 modular sound boards, but they work fine with RS4, 5, and 5.5 boards. Could I use a Lionel 10k pot from another locomotive in this case instead of the mini one. Sure, I've extended several of them. The left hand one has the pot connector for that very reason. For the old ERR one, I used to extend them to the chassis mounted pot. Thanks, one other question. I am planning on purchasing your chuff generator. Do j connect the J2 5vDC pin to the 5VDC pin on the railsounds board? I always have my own power source, usually the Super-Chuffer. I'm confused, the RS board will be in the tender, right? Obviously, the Chuff-Generator will be in the locomotive. I have a tether with extra wires to use. Well, I've never thought of powering it from the RS board, but I can't offhand see why it wouldn't work. The C-G takes about 30ma to function, hard to believe that's not available from the RS power supply. Yeah cause Next to the chuff pin on the railsounds boards is a 5vDC pin. I'd make REALLY sure that the AC and DC grounds were common, as if they're not, you'll likely cook the Chuff-Generator. You would probably be all right if you used all three of those connections, but I believe that DC ground may not be common with the frame. What would you recommend I connect it to if I'm not using a super chuffer? 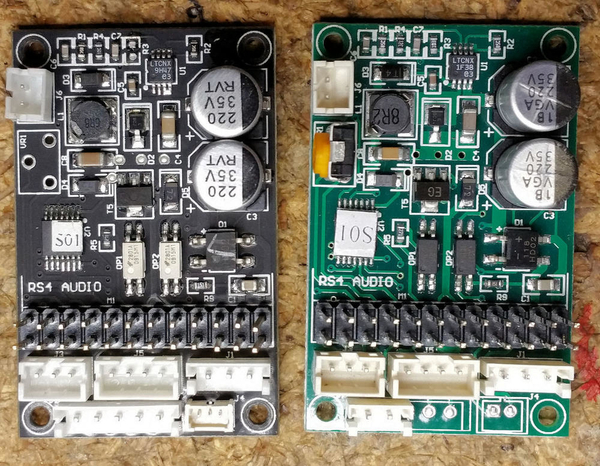 I use a separate 5V supply when I have an installation without the S-C. My 5V supply does have a common frame ground. 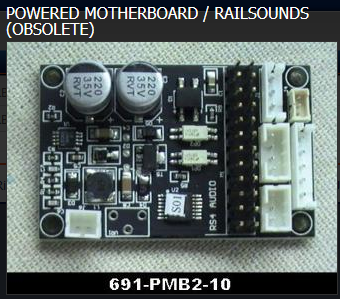 How would I check to make sure the railsounds board has a common frame ground? Take ohmmeter and measure between the AC ground and the DC ground. If they're not connected with close to zero ohms, don't use that 5V supply. I have been working on the engine with the powered motherboard and it working, but the sound seems strange. Whenever a sound like the whistle ends, there is this sort of gargled vibrating sound. Also when that is happening the speaker is moving a lot. Any idea on what is occurring here. Well, I'd check the speaker first, just strap another one on. If it's not the speaker, then my next test would be to check out the RS board in my test rig. If that was good, it leaves the powered motherboard. 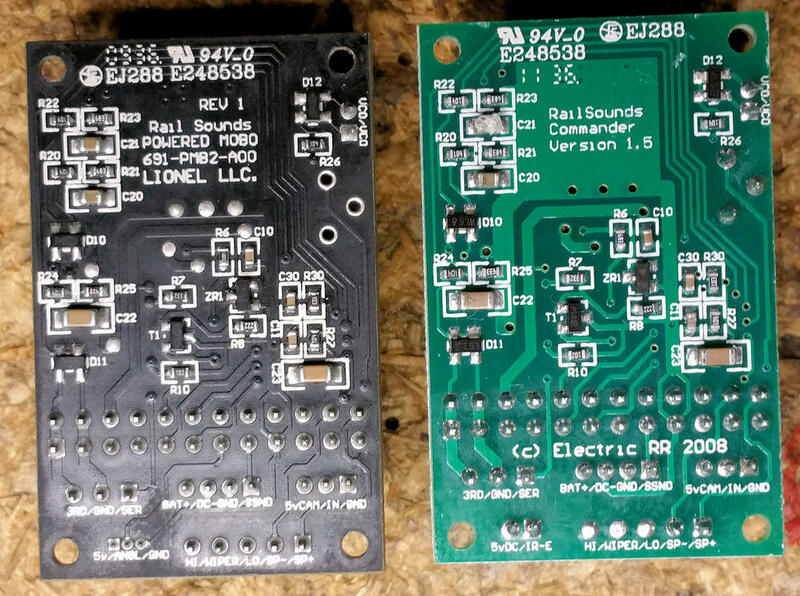 Have you ever had any issues with sound quality with railsounds boards? See what Ohm rating the speaker is putting out as well. I notice that when I turn the volume pot down a little, the sound will go away. The volume pot sounds suspect from that description, Jim is right. As far as sound quality, there has been less than optimum sound from some boards, but this doesn't sound like that issue. This is the pot I'm using. It's not the part number that's the problem, the suggesting is the pot is simply defective. Turn the pot fully CW and then short the right hand two pins together with a jumper as a test, see if that helps. Would this just be a bypass of the entire volume pot? Yep, we're just turning it up to full volume so that the lower end connection doesn't affect things. 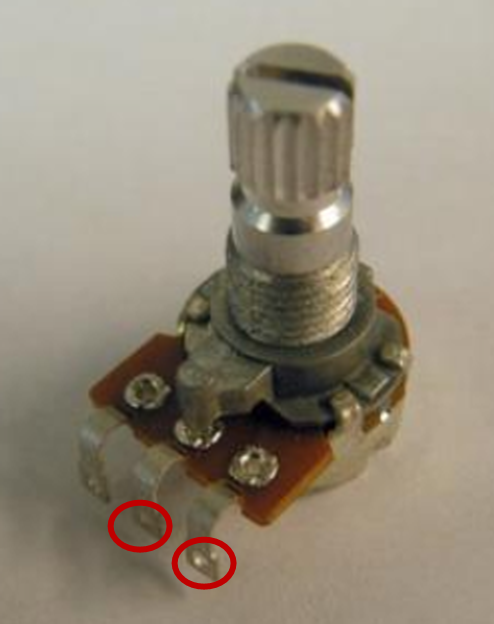 Obviously, if you just connected those two pins at the connector and unplugged the pot, you'd achieve the same result, but the pins are small. I have done what you said but still the same results. Here is a video to show what is occurring. Well, something broken. Hard to say what without testing the parts. I figured it out. I swapped the motherboard for another one and it resolved the issue. Makes sense, I bought a few of those from Lionel and two of them were bad right out of the gate. Kinda' soured me for buying any more. I've had a few bad boards from Lionel in the last 1.5 years. Just recently a Lionchief Polar Express board. Didn't work. I've got a spare (Frosty the Snowman) board I use to test so I know the engine is good. I've had them tell me they test them all before shipping - but I'm not totally believing it. Of course they don't send out bad ones on purpose. I don't believe the testing of all the boards before shipment, I've gotten too many bad ones. Of course, if you look at the older TMCC era boards, they're frequently pulls from old stuff, and I'm sure whatever they came out of had some sort of problem! When I order boards now, I test them as soon as they come in the door. Funny thing, when I do that, I get a lot fewer bad boards, it's almost like the gremlins know I'm looking for them!